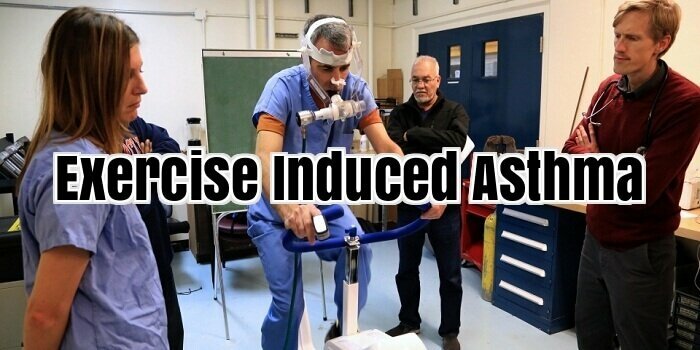 1 What About Exercise Induced Asthma? 4.1 Are There Specific Exercises An Asthmatic Can Perform? 4.2 Can Exercise Induced Asthma in Kids Be Prevented And Treated Effectively? What About Exercise Induced Asthma? Are you one of the people that only gets asthma attacks when you run or exercise? If so, you are one of the few to suffer from what is known as exercise induced asthma. In past years, medical professionals used to think that this exercise induced condition was a completely different form of asthma. But nowadays it’s a well known fact that asthmatics have a worsening of their symptoms right after heavy exercise, even to the point of triggering an attack. This ‘asthma from exercise’ is a problem that is very heavily slanted towards children and young people in general, something which also used to puzzle doctors in the past, but of course, children and teenagers exercise a lot more than adults do, so the adults don’t really get the symptoms from exercise in the first place! So what is exercise induced asthma really? It’s simply a regular form of the disease which is just too mild to show up in most conditions, and needs that extra big provocation, like an unusually intense and long bout of running or biking, to come into view. If the air you breathe while you are taking exercise if dry and cold, then the attack will be even worse, while if it is warm and moist air, the symptoms will be less pronounced. What happens is, the increased breathing in and out that happens during exercise dries up the lining in your lungs, and if they cool down at the same time, they will try to swell with blood to warm up and rehydrate again, and this will definitely worsen any asthma condition. A respiratory disorder that is often chronic, asthma is a condition that is not pleasant and which is also known to cause many discomforts including inflammation in the airways. This blocks air from getting to your lungs and results in mild to severe breathing problems which are commonly referred to as asthma. An asthma attack is also known to onset suddenly and it is often also caused by allergens present in the environment that an asthma sufferer finds themselves in. There is also exercise induced asthma to contend with and this is a most common form of asthma that can often occur after a person has done some strenuous physical exercises. In fact, according to doctors who have studied exercise induced asthma, the causes of the attack could even be due to abrupt changes in a person’s body temperature as well as because of the body’s sensitivity to humidity. Understanding the causes could help you to find asthma relief. When a body is at rest it usually results in a person breathing through their noses, which in turn means warming up as well as humidifying the surrounding air. This in fact starts to become quite like the air that is already inside the lungs. However, exercise induced asthma can actually be caused when the exercises a person does cause them to breathe through the mouth and there is a difference in temperature between the colder air that is inhaled and the warmer air inside the lungs. This, in turn, is believed to cause an asthma attack. Nevertheless, why exercise induced asthma occurs has been known to vary from patient to patient and triggers that can cause asthma are varied. These causes can include contaminated air, polluted air, smoke and vapours as well as chemical particles and more. The moment an asthma attack begins the airways inside bloats up and secretion of mucus results. Together they end up blocking the patient’s airways, and this leads to difficulties in breathing. Fortunately, there are a number of treatments for exercise induced asthma including suitable medications which can help even a person affected by exercise induced asthma to lead a normal life once more. There are, in fact, even known instances of professional class athletes who have competed in spite of suffering from exercise induced asthma. It only takes learning asthma breathing exercises to overcome different kinds of asthma problems, and by learning how to relax the chest muscles, relief will soon be forthcoming. The only criticism to using medications to treat exercise induced asthma is that in the case of professional athletes, this means provides them with an escape route to try taking performance enhancing drugs in the guise of treating their exercise induced asthma. The choking of the airways causes different symptoms including hacking, snugness over the chest, wheezing and shortness of breath. These symptoms for the most part start to back off over a time of thirty minutes or somewhere in the vicinity emulating exercise. When you exercise or move strenuously, you have a tendency to breathe faster and through your mouth. When you breathe in through your mouth, the air that you breathe in does not experience the humidifying and warming process that happens when you breathe gradually through your nose. All things considered, the air that enters your lungs is colder. Individuals with exercise-induced asthma have lungs that are exceptionally touchy to this sharp change in temperature, which bothers the airways and reasons different asthma symptoms. The seriousness of symptoms and the affectability of the lungs change from individual to individual. Experts recently discovered a medication free, long haul answer for exercise-induced asthma. The remedy is Fish Oil because of the omega-3 crucial fatty acids. Various patients were provided with Fish Oil for three weeks. The supplement incorporated 3.2 grams of the omega-3 fat eicosapentaenoic acid (EPA) and 2.2 grams of an alternate omega-3 fat, docosahexaenoic acid (DHA). The other assembly took cases with olive oil. Following three weeks, the treatments were exchanged unknowingly. To measure their lung work, the members were made to run on a treadmill until they were exhausted. They took a lung capacity test fifteen minutes after their exercise. When they examined the information, the scientists watched that competitors with exercise-induced asthma had an 80% change, in view of their lung capacity test. Their utilization of asthma medication likewise went around 20%. Fish oil – an effective way to cure exercise induced asthma Omega 6 is found in prepared foods, vegetable oils, meats and dairy items so there is a wealth of them in your diet. But Fish Oil is the best alternative. Along these lines, consequently, Fish Oil offers a feasible and more secure elective. An alternate point deserving of thought is that long haul utilization of medication for asthma can make it less viable and obviously as with any medication there can additionally be unwanted reactions so if fish oil can reduce the need for medication and inhalers in individuals with exercise induced asthma, then that is exciting news to be sure. Fish oil is now known to offer both preventative and remedial health profits for various conditions thus is an excellent supplement to push great health as a rule. However, an expression of alert, as you are considering attempting fish oil supplements it is vital to pick just for the best quality fish oil known as pharmaceutical evaluation fish oil because of the possibly hurtful toxins that might be available in lesser evaluation fish oils. Children affected by exercise-induced asthma will often find the airway muscles reacting to a sudden change in temperature very sensitively by contracting and trying to prevent the cold air from entering the body. Generally, within 5 to 20 minutes of starting an exercise or 5 to 10 minutes after stopping it, symptoms of asthma exercise-induced asthma can be observed in children. The doctor should be immediately informed of the symptoms as soon as they arrive. It is possible to prevent the symptoms of exercise-induced asthma in kids with the help of bronchodilators and asthma inhalers before starting an exercise. Albuterol is a short-acting beta-2 agonist that is very effective in preventing asthma. It should be taken around 15 to 20 minutes before starting an exercise. The medication is capable of controlling symptoms of asthma for around 2 to 3 hours and can effectively prevent contraction of airways. Long-acting beta-2 agonists such as Foradil and Serevent can be taken before exercising. They afford around 12 hours of relief from asthma. Symptoms of exercise-induced asthma can be easily avoided by taking in these medications in the morning, which then allows a person to indulge in exercise at any period of time during the day. It is necessary to avoid using these treatments routinely on a daily basis, as other prescribed and effective medications in the treatment of asthma are available. An asthma inhaler is an emergency medication that is required to be available in case symptoms persist after regular medication. Following correct techniques of warming up before starting an exercise and performing cooling-down exercises after completing an exercise regimen will also help control symptoms of asthma in kids in addition to the medication. People suffering from asthma as well as allergies need to tone down the level of exercise on days when pollen content in the air is very high or if temperatures fall down to very low levels combined with a high level of pollution. Asthma symptoms can also increase if a person suffers from infections such as sinusitis, colds, or flu. Under such circumstances, reduced exercise is the best course of action. Are There Specific Exercises An Asthmatic Can Perform? Yes, some physical activities are more appropriate for children suffering from exercise-induced asthma. They should take part in activities that include short exercise periods performed intermittently including activities such as baseball, volleyball, wrestling, walking, or gymnastics. People suffering from exercise-induced asthma can easily tolerate any of these activities. People involved in physical activities that demand a lot of stamina and lead to exertion including distance running, field hockey, soccer, or basketball may bring in symptoms of asthma. Also, sports played in cold weather such as cross-country skiing, ice skating, or ice hockey makes induce symptoms. Nevertheless, several asthmatics are still able to participate in these sports or physical activities. Even though swimming requires a lot of stamina and endurance, symptoms of asthma in kids can be avoided by participating in rigorous swimming sessions, as the atmosphere around the water is controlled, warm, and moist. An active lifestyle must be maintained including rigorous exercise to control symptoms of asthma. Mental and physical health is dependent on it. An asthmatic must be able to take part in physical activity and sports effectively. Can Exercise Induced Asthma in Kids Be Prevented And Treated Effectively? Whenever cold weather sets in, exercises must be performed indoors and care should be taken to use a scarf or some other material to cover the mouth and nose. Before starting an exercise a prescribed drug must be inhaled to prevent symptoms of asthma. Perform exercises at a comfortable level, which does not exert you too much. Use proper techniques, warm-up, and cool-down exercises after each exercise session. Perform exercises at a lower level in case of viral infection. Take necessary outdoor precautions during seasons like summer or spring when pollen count is high or a high level of pollution is observed. It is better to avoid outdoor activity, especially if you suffer from allergies. Exercise should not be avoided or used as an excuse to take part in physical activity. Proper diagnosis and treatment will enable children to lead a full life participating in a sport or physical activity they like without suffering from the symptoms of asthma in kids.